The most recognizable church on Anglesey, St. Cwyfan's, is popularly known as the Church in the Sea (or eglwys bach y mor in Welsh). Perched on a tiny island called Cribinau, encircled by a sea wall, this simple medieval church dates to the 12th century. It is thought to be dedicated to the Irish St. Kevin, who founded the monastery across the sea at Glendalough in Co Wicklow, Ireland. 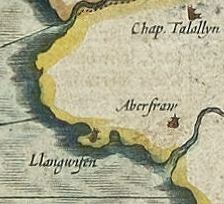 It may seem an odd and perilous place to build a church, but it originally stood at the end of a peninsula between two bays, Porth Cwyfan and Porth China, as shown on John Speed's map of Anglesey from 1636 (shown left). In the decades after this the sea slowly eroded the coast in the two bays enough that the peninsula was cut off, turning it into an island. A causeway was built to the island to allow parishioners to get to the island. Its remains are visible in the picture below. However, even with the causeway, sometimes high tides prevented access. At those times services were held in a room in the nearby house, Plas Llangwyfan, which was specially consecrated for the purpose. The waves continued to eat away at the island until, in the late 19th century, some of the graves surrounding the church began to fall into the sea. At this time the church was also disused and roofless, having been replaced by a new church further inland. However, in 1893 local architect Harold Hughes, concerned for the fate of this evocative old church, raised money to save it by constructing a seawall around the island and restoring the building. Although the church was initially built in the 12th century, only a small portion of the south wall dates from this period. Most of the walls were rebuilt during a 14th century reconstruction. In the early 16th century an aisle was added to the north side, accessed through an arcade of three arches, but it was demolished in the early 19th century as the cliff edge eroded ever closer. The infilled arches can now be seen in the outer wall, after the old cement mortar was removed during refurbishment in 2006. This refurbishment also involved limewashing the walls, making them very white, to the consternation of some locals who were used to the old grey appearance. This tiny church was at the centre of a big controversy in the 18th century. In 1766 the Bishop of Bangor appointed Dr Thomas Bowles as the parish priest of Trefdraeth, which included St. Cwyfan's as a chapelry. Unfortunately Dr Bowles spoke no Welsh, and only five of the 500 parishioners understood English. They protested against his appointment and eventually the case was heard in the ecclesiastical court in 1773. The judge ruled that Bowles should not have been appointed, as Welsh speaking priests should be sent to primarily Welsh speaking parishes. However, once a priest has been granted ecclesiastical freehold of a parish it is very difficult to remove them, so the judge ruled that he should be allowed to stay in his post, which he did until his death later that year.